Electronic consultations, or “e-consults”, were first launched in 2005 by San Francisco General Hospital and the San Francisco Health Network (SFHN) to understand whether primary care providers in the safety net might be able to treat complex patient cases with the guidance of remote specialists. By connecting primary care providers and specialists through electronic communications, SFHN’s use of e-consults revealed how they helped to deliver efficient and effective care. Today, e-consult has expanded beyond safety net providers like the SFHN to other large health systems and academic medical centers and is supported by both commercial and Medicaid payers. 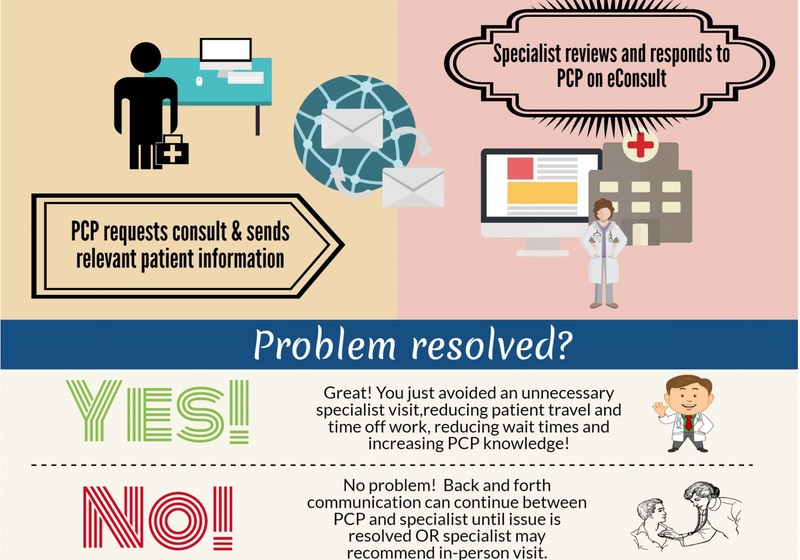 An e-consult is an asynchronous, typically remote, dialogue initiated by a primary care provider (PCP) seeking a specialist’s expert opinion about a patient’s condition. These differ from synchronous telehealth such as live video visits. The initiating provider sends a secure message, often with lab reports, images, or other necessary documentation, to the specialist asking adviceabout diagnosis, patient management, drug treatment, or procedures. With an e-consult, specialists can respond by providing recommendations for further treatment by the PCP, asking for further information before recommending next steps, or suggesting a referral be made to a specialist. Specialists’ recommendations for treatment that can be managed by the PCP often have the greatest impact on individual health by providing faster access to care, i.e. input from a specialist without a face-to-face appointment. Researchers estimate that up to 40% of specialist referrals might be avoidable through the use of e-consult and e-consults may lower the overall demand for face-to-face visits, reducing the total number of days patients wait to receive specialty care. In other words, e-consults often mean a patient doesn’t have to attend or pay for a specialist visit, and when they do, those visits are faster and more efficient because the e-consult dialogue has already captured PCP and specialist notes. The very large body of e-consult research also suggests that e-consults provide additional benefits beyond efficient access to specialty care. PCPs report high satisfaction with the quality and expedited turnaround time of specialists’ responses. The efficiency of e-consults improves PCPs’ ability to deliver higher quality patient care, improving their job satisfaction. Studies also report high patient satisfaction with e-consults and increased convenience associated with avoiding unnecessary in-person referrals. And, most importantly for the American health system overall, e-consults have been associated with increased cost savings. Recent wins for e-consult champions include a The New York Times article that emphasizes e-consult’s benefits and the inclusion of “interprofessional consultations”, e.g. e-consults, in the Medicare Physician Fee Schedule of reimbursable services. Through support from the Blue Shield of California Foundation and California Health Care Foundation, advocates in California created the E-Consult Workgroup and an online toolkit in 2016 to promote the spread of e-consult across California’s safety net. However, work remains in California – and more so in other states—to have e-consults considered in network adequacy determinations for health plans and in reimbursement by state Medicaid programs and commercial payers. Providers now consider e-consult as the standard of care, but work remains to ensure payers and policymakers have the same understanding of its benefits.